Check out all our videos HERE! Hidden Vision is a division of Mark Joseph Design LLC. and specializes in easy to install TV mounts that uniquely hide your television and more! Our TV wall mounts require no significant modifications or customization to your home. They can be installed on a standard 2x4 wall similarly to a typical TV wall mount. For this reason, our products are a great alternative to traditional TV lifts, art lifts, TV mirrors, or television frame covers. If you want to do something a little more custom, you can also build our products into a wall or use a custom panel or frame. Check out our YouTube channel for videos of built-in applications and feel free to contact us for more details. If putting together the order seems complicated, our help desk will guide you through the decision making process. Once you order you’ll be happy to find that our tech support is unmatched. We provide our customers with a direct number to a knowledgeable tech support rep who is available most evenings and weekends. Simply put WE TAKE CARE OF OUR CUSTOMERS. We are passionate about the products we create, and there are few worse feelings than finding a customer is disappointed with something you've created. Quality is our #1 priority and is never sacrificed for speed or profit. Hiding your television is our business! Keep the room looking clean and tidy is our ambition. 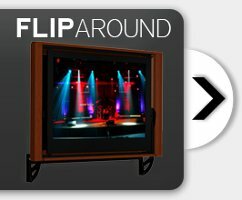 The Flip Around flips 180 degrees to one side and reveals your television screen, and the other side features the artwork of your choice or a mirror. When closed against the wall, the frame completely disguises the fact that you have a television inside. In 2013 at the CEDIA Expo we received a BEST NEW PRODUCT AWARD for our Motorized version of the Flip Around. Seeing this in person for the first time is simply impressive. We've been manufacturing the Extended Flip-Out since 2010, received an Innovation Award at CES in 2012 and our patent in 2014. This mount is tried and true and will impress you. Customers who purchased our first model in 2010 are still using it today. 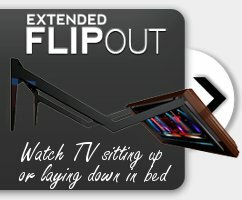 The MOTORIZED Extended Flip out is here! We have a variety of wood frame to choose from, and you can insert any art print or photo you wish to see inside the frame or maybe us a mirror and see the best picture in the house! It’s up to you to decide which you would like.